Brigandine arms are typical for 1360-1440 years. It is a part of brigandine kit. 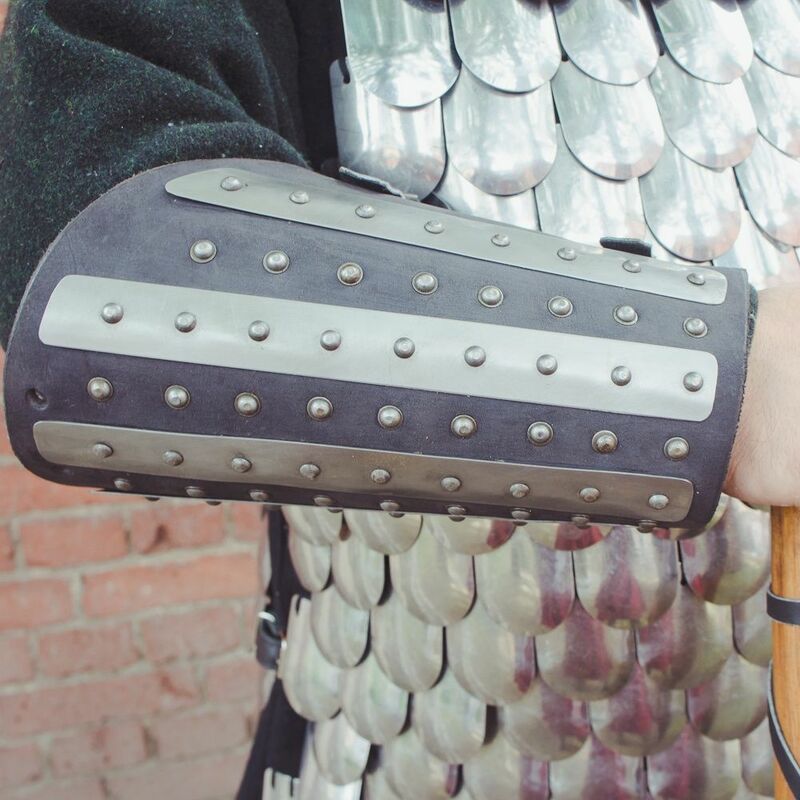 Arm protection consists of: -brigandine bracers -brigandine protection of upper arm -plate shoulders -plate elbows Brigandine parts are made of leather with thickness 3-4 mm. Please choose type and thickness of metal in options. Brigandine arms will be a perfect addition to leather brigandine with skirt. Brigandine bracers are know from the X century and they were popular among european warriors and the eastern tribes. It has been used together with mail, but with the appearance of plate armour it became less actual. These short brigandine bracers are made of thick (4-6 mm or 15/10-23/10 inches) croupon leather with rivetted metal plates. Bracers are being fixed on your arms with high-quality leather straps and provides good protection during the battles with wood or plastic weapon. We do not recommend you to use it during the battles with steel weapon. Splinted protection was widespread in the XIV-XVI centuries and was very popular among the european and asian warriors. This model of bracers is made of croupon leather with thickness 3.5-4 mm and normal steel pates 1.0 mm. The main specific of splinted armour is the plates, that are riveted both to the outer and inner side of bracer. There are leather belts with steel buckles for the fixation on the arm. 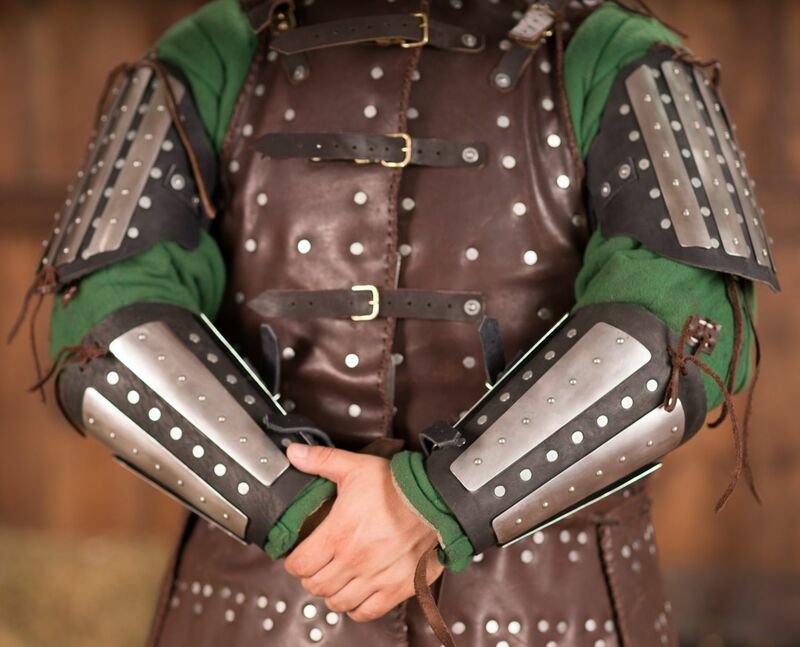 Splinted bracers together with elbow caps, plate spaulders and splinted protection for upper arm make a perfect unit of medieval arm protection of the middle XIV century. We recommend you to use bracers only over the gambeson. This section contains different types of brigandine arm protection. Here you can see various models of medieval protection, which was widespread in Europe, Asia and Вyzanthium. Every item is handcrafted according to customer’s parameters. Brigandine and splinted armour is based on the original samples, which you can see in the old manuscripts, in museums or on the gravestones. History of the Middle Ages provides us with a lot of evidences of usage of brigandine arm’s defense. Steel plates were riveted with overlap on the leather or cloth base. Such method gave high level of protection of crushing blows, stabs and slashes. At the same time, such armour did not hinder movements of knight and weighed less than chainmail. Besides, it was rather easy to make such armour (skills of top-level armorer were not required). Every competent forger could create brigandine elements. In addition, comparing to plate armour, brigandine protection was cheaper. These features determined almost all-round usage of brigandine armour in the XIII-XIV centuries. But as historical sources shows, knights were used to wear brigandine bracers and protection of upper arm even in the XII century. These elements of medieval protection can be seen on the frescoes of Karner tower (Hartberg, Austria). Brigandine armour hadn’t get out of fashion even with development of plate defense. Combined splinted protection was the most widespread variant. Typical feature was riveted plates on the outside and inner side of base. Such design was raising protection properties of armour and didn’t have any gaps for blades. At the same time, combination of splinted and plate elements became very popular among knights. For example, brigandine or splinted bracers and protection of upper arm were complemented with plate elbow caps. These details didn’t reduce mobility and covered joints. On the statue of Günther von Schwarzburg (Frankfurt-Am-Mein, Germany), you can see combination of brigandine bracers and bicep armour, and plate elbow caps. Such version of protective gear was typical for the XIV-XV centuries and usually was completed with plate spaulders and gauntlets. So, warrior’s arms were almost completely defendable.